Ready to take the Chicago Architecture Center to the next level?! 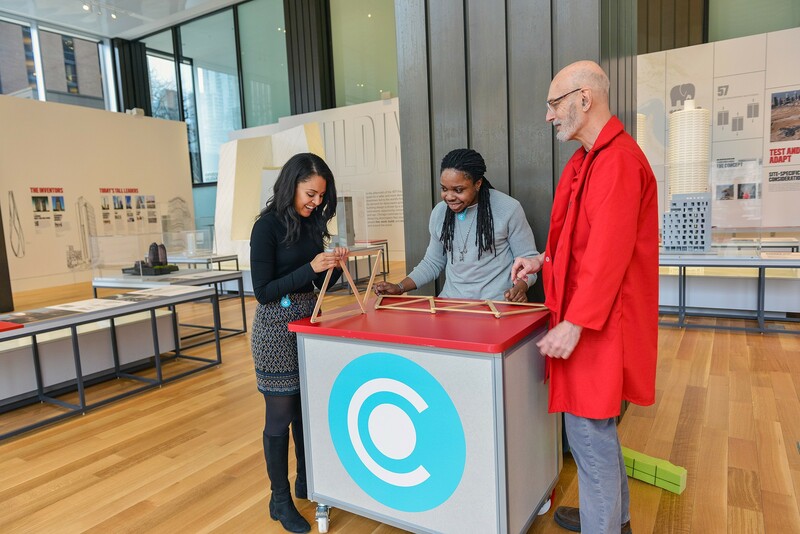 Visit our Mobile Architecture Lab on Fridays, Saturdays and Sundays between 11am and 3pm to interact with the CAC exhibits in new and exciting ways. The lab features fun, hands-on activities for all ages, with themes that change each month. Our volunteer Education Guides facilitate these activities, with support from the CAC education department. What ages are these programs best for? The programs have been designed to scale up or down, to accommodate our littlest builders (age 3) up to adults. Are there activities that I can build and take with me? Yes! Some months include a make-and-take activity. Check this page for updates! Take a close look at common shapes and materials used in Chicago’s architecture. Make-and-take activity included. Hear about the ongoing race to build the tallest building in the world and create your own skyscraper. Make-and-take activity included. Explore our galleries and engage in sketching activities to learn about architecture and design. Come learn about the six simple machines: wheel & axle, inclined plane, wedge, lever, pulley and screw. Learn about the science of architecture by taking part in interactive, STEM-based activities that explore structural elements and the science behind buildings. Take a look at common building styles around Chicago! Learn about its influence and how to identify a building by how it looks. Come learn how to read a building! Take a look out the window and see some of the skyscrapers and building elements. Did you know Chicago is often known as the city of neighborhoods? Learn about some of Chicago’s historic neighborhoods and its characteristics. Whether you’re new to Chicago or a Chicago native, come learn more about Chicago and its homes. This free, drop-in program does not require a ticket. It is free with CAC admission, but spots are first come, first serve. You can purchase a CAC admission in-person at the CAC box office, or online prior to your visit.